The entry into the eddy current structure test. 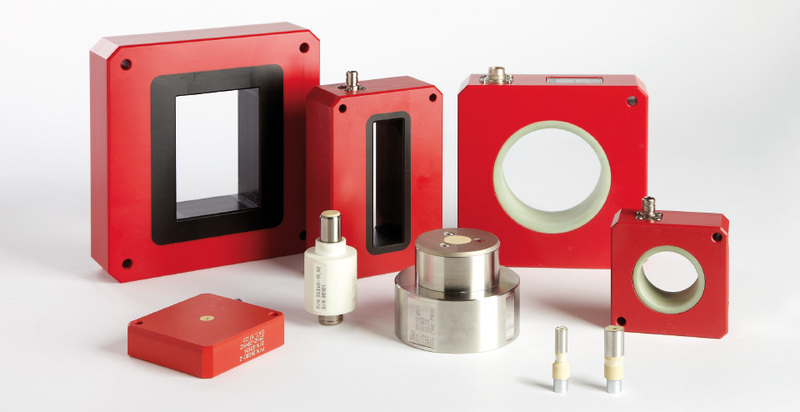 Digital eddy current test instrument for one channel nondestructive testing of metal components, mass produced parts and semi-finished products according to the Preventive Multi-Frequency Technology (PMFT). Testing for material properties such as hardness, case depth, structure, tensile strength, heat treatment or alloy. 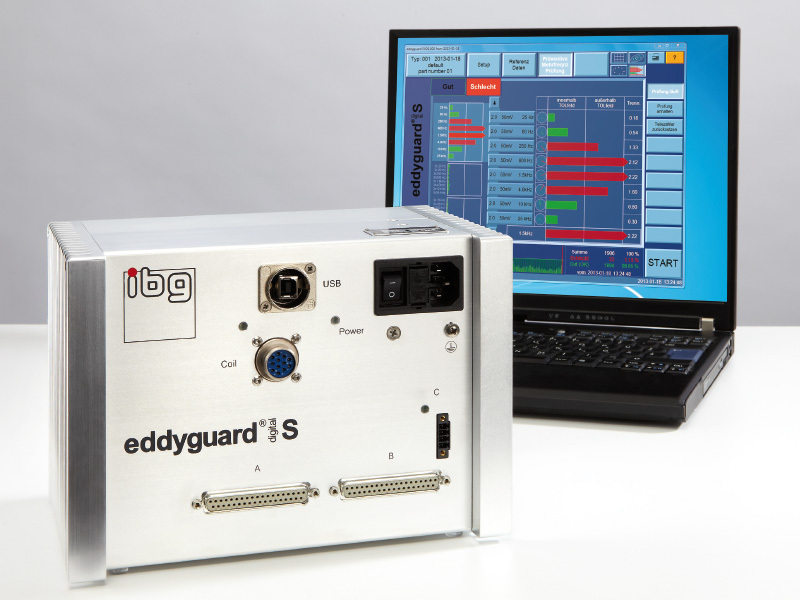 The eddyguard S distinguishes itself with compact design and concentration on one channel structure applications with one coil at one location combining that with the well-known ibg test reliability and ease of operation. Configuration is effected by means of a PC or a laptop supplied by customer via the USB-port. The ergonomic interface of the PC-software facilitates intuitive and simple operation After configuration is finished the eddyguard may be disconnected from the PC/laptop. The eddyguard continues testing selfsufficiently. 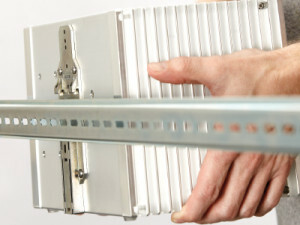 The eddyguard is based on the ibg system concept proven for decades. All coils and probes of the ibg system family can be used. 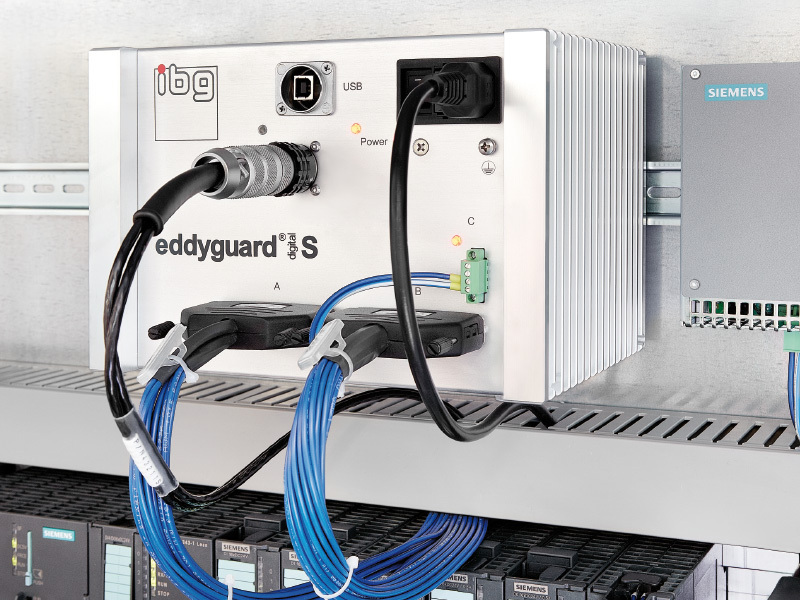 The eddyguard is therefore recommended not only for the solution of new tasks but also as an upgrade for existing installations to be equipped with state-of-the-art eddy current technology. Digital processing of the measuring signal with special processors immediately after the pre-amplifier guarantees highly stable test results. Calibration with ibg’s unique “good-part-only-concept” enables setup within a few minutes true to the motto: “Do you still calibrate or are you already testing?” An adequate number of good parts is recorded as reference parts with connected PC/laptop. From the eddy current signals tolerance zones are automatically generated encompassing the metallurgical magnetic fingerprint of the group of good parts for all PMFT test frequencies of the fundamental wave and two harmonics. After recording of good parts, testing can be immediately started. Faster starting yet more reliable eddy current testing is not possible. When recording material data with a PC/laptop the eddyguard automatically generates elliptical tolerance zones for a reliable test. A tolerance zone editor is integrated for special applications enabling the skilled user to freely define the zones in rectangular or elliptical form. In addition to the eight fundamental test frequencies, two harmonics (2nd to 9th harmonic selectable) for each test frequency can be turned on and simultaneously evaluated without increasing the test time thanks to the iSHA-technology (ibg‘s Simultaneous Harmonic Analysis). Test results are shown as bargraph, single ellipse or multiple ellipses, selectable. A multitude of encircling coils up to a diameter of 500 mm as well as structure test probes are available for standard applications. Customised coils (i.e. ID coils and rectangular coils) for special applications are designed and manufactured in-house. Test coils may be connected either as ibg recommended compensating pair of coils or as self-compensating single coil. Monitoring of coil and cable failure as well as a 50/60 Hz noise suppression can be activated. ibg offers also a range of durable highspeed sorting devices for test parts up to 60 mm diameter. Start of test can be manually on the PC/laptop via PLC or optional start button. There is an autostart function that detects the part in the test coil and activates testing immediately or after an adjustable delay time. High speed testing within milliseconds. Using eight test frequencies, a cycle rate up to seven parts per second with encircling coils and 25 parts with probes can be realised with standard settings. Maximum 20 part types with all settings and reference data can be stored in the device memory and switched over manually via PC/laptop or via PLC for automated processes. Part types and instrument settings are stored on the PC/laptop and may additionally be saved e.g. onto an USB-stick. Direct control of sorting devices, paint marking systems or indicating lamps is possible with merely an external voltage source 24V DC, providing a low-cost solution for small automated systems without an additional PLC, too. by means of the delivered ibg operating software to be installed on a PC/laptop supplied by customer. System requirements: USB 2.0 and operating system MS Windows 7 (32 or 64 bit) or Windows XP (32 bit). The software for the PC/laptop has a context sensitive help function which often renders a look into the manual unnecessary. The software for the PC/laptop may be set to German, English, French, Spanish, Italian, Polish, Portuguese, Czech, Hungarian, Chinese, Japanese, Korean and Russian. Other languages as option. High testing accuracy and temperature stability – coils and probes of different design for structure test. USB 2.0 for connection of a PC/laptop supplied by customer.